Casio has announced a 360° camera that features a detachable lens unit and a mode that allows the body to control two cameras at the same time. The Casio EX-FR200 is equipped with a 1.35mm lens that offers a fisheye capture with the angle of view we’d expect from a 13.4mm lens on a 35mm film camera. The lens can be used in four different modes to either capture a 180° 3888 x 3888 pixel fisheye spherical view, an unwrapped 360° 7456×1864 panorama, a super-wide 208° image or when combined with a second camera it can join two images shot in opposite directions to create a 360° ‘omni-directional’ image. The camera consists of a body unit and a detachable lens/camera unit that can be used separated from the body, or folded for ‘normal’ shooting or selfie shooting while connected to the body. 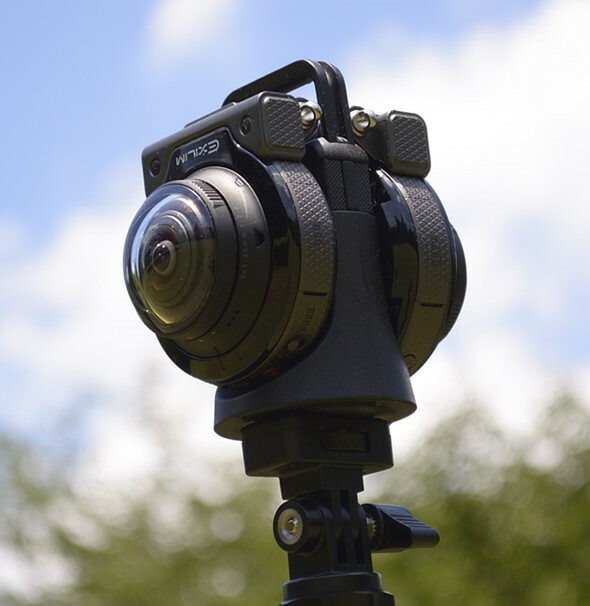 Casio has also produced an accessory that mounts a pair of FR200 or FR100 lens units back-to-back so that they can shoot in both directions simultaneously to create images that can be merged in Casio’s Exilim Album app or Exilim 360 Viewer desktop software to form a navigable YouTube 360 Video file. The camera can also control dual lens units in sequence from different perspectives while pointed in the same direction. The FR200 is waterproof, freeze-proof and drop resistant for use in tough environments, and communicates via Bluetooth 2.1 and Wi-Fi. The camera also has a 4K video function. Beyond Japan it isn’t clear where the camera will be sold, but the company plans to make 5000 a month from the time it is released in mid-September. For more information see the Casio press release (translated version).